In France this species is restricted largely to the north-eastern quarter and also some areas of the Alps. 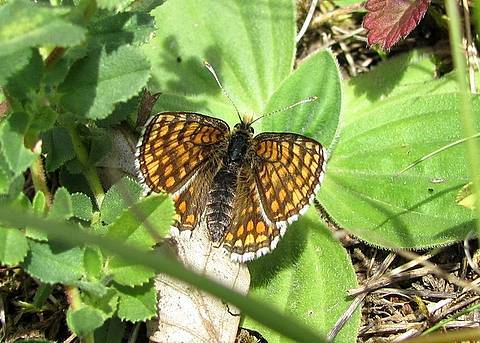 Initially, it is a difficult species to detect and identify, resembling the Heath Fritillary in particular. At the first encounter, it is certainly most helpful to be guided by a lepidopterist with experience of the species in the field. At this location in the Bourgogne region of France the first thing that struck me was the habitat, which may prove to be typical. It was calcareous grassland, in which there were numerous scabious flowers and of course plantains for the females to lay on. With Heath Fritillaries in the habitat too, after some comparison it becomes easier to identify the Nickerl's Fritillary. 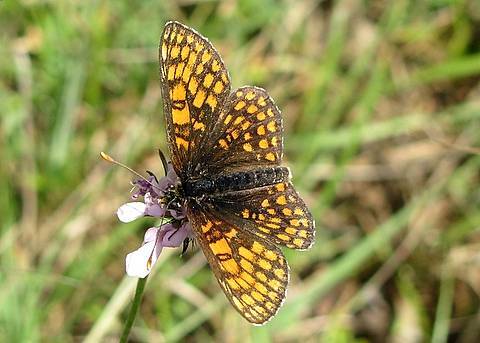 The Heath Fritillary is larger with more orange, and flits purposefully from one flower head to another. 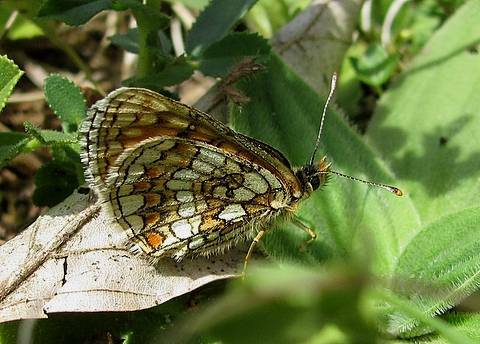 In contrast, the Nickerl's Fritillary is a smaller insect and rather duller. In flight it is more of a 'buzzer', dithering amongst the flower heads with rapid wing beats before finally deciding to settle to nectar. The upper hindwings are the most characteristic. The orange markings are all well separated, with a marginal row first, and then a post-discal row which tend to be rather rounded. Beyond this row, the discal and basal arrangement is rather particular and uncluttered.